I like to think that military kids are a special breed. Maybe that’s because I’m raising two of them or because I have spent a lot of time around military kids of all ages over the past many years. They are resilient little people who typically know a lot more about the workings of the world than your average child. They also face challenges like moving duty stations, frequently having to make new friends, handling the anxiety of a parent serving in a war zone, and having that parent miss important life events like birthdays, holidays, and sports games. The first night can be the hardest. Dad is absent from the dinner table and they miss his goodnight kisses. Normally our kids are not allowed to sleep in our bed, but I make a special exception on the first night of Handsome’s deployments or extended training trips. Their excitement about our “sleepover” helps overshadow the sadness about Daddy leaving. Kids need the physical affection of their father as much as they do their mother. When he’s home Handsome likes to wrestle with them on the carpet, snuggle up on the couch, and massage their feet before bedtime. 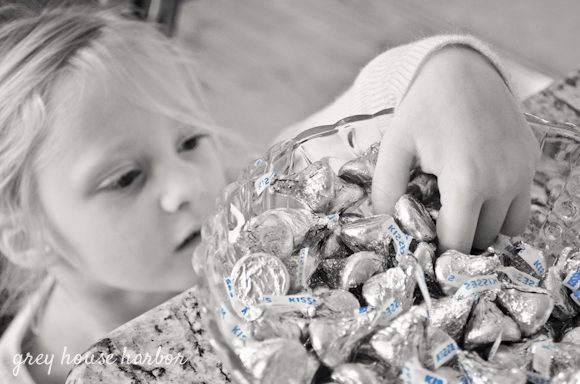 During deployments, I keep a big bowl of Hershey kisses on the counter. 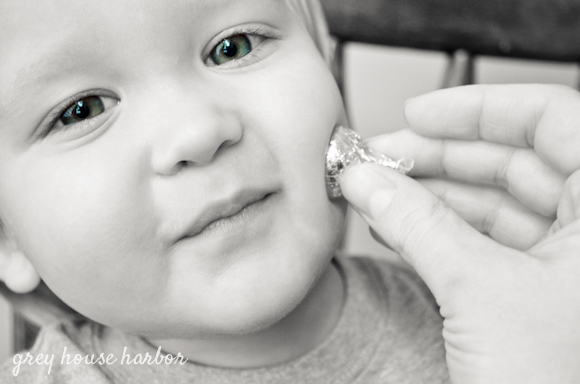 Every day each kid gets to choose when they want their “kiss from Daddy;” whether it’s first thing in the morning before breakfast, after school, or even when they’ve already brushed their teeth for the night (and then have to brush again). Allowing them the power to choose gives them a small sense of security over a circumstance that is otherwise out of their control. The only rule is that they must smooch it on their cheek before eating it! Who doesn’t love getting real mail? Handsome tries to remember to send postcards when he travels. 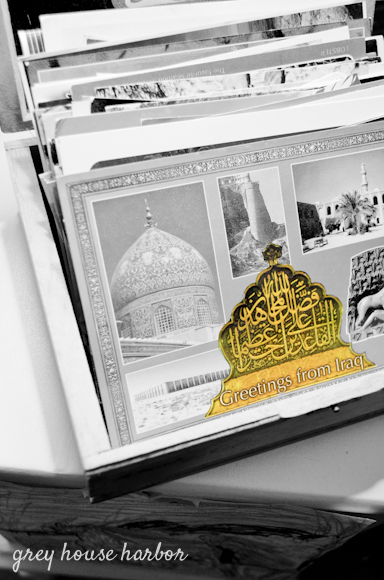 I help the kids find the country or city on our world map, then the postcard goes into a little treasure box. Some day these will be precious to them. 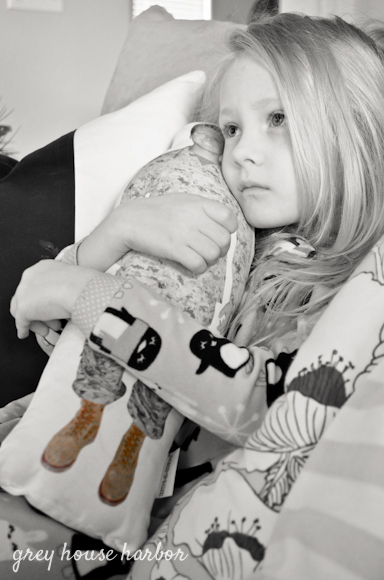 There are lots of great resources, both printed and online, that are designed to address the special emotional needs of military children. Sesame Street has put together a series of videos geared towards military kids about deployments, homecomings, grieving, and being proud of your military parent. Elmo does an excellent job of presenting the topics in a relatable way for small kids. They also offer printables and other help for adults. This page is full of excellent links to all kinds of support. 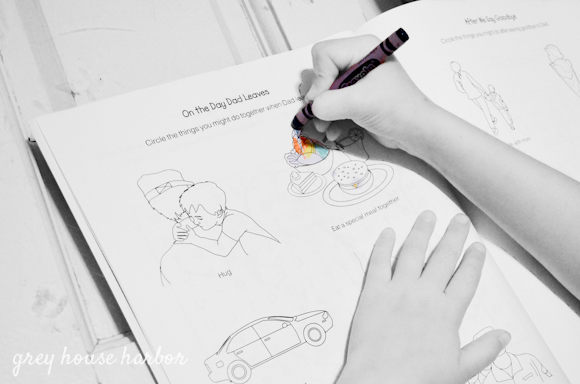 I find that coloring creates an optimal atmosphere to discuss what my kids are feeling. I prompt them with questions like, “How are you feeling about Daddy today?” or “What are you looking forward to doing when Daddy gets home?” Questions that require more than a “yes” or “no” answer help me gauge how they’re coping and give me a chance to encourage them through conversation. There’s nothing like a good old fashioned paper chain. Children benefit from the visual countdown to Daddy’s return and enjoy ripping off a ring each day. A 6-month deployment would be way too many loops, so we make them for the final month or when he’s gone a couple weeks for training. Handsome was overseas when I first heard about Daddy Dolls. You can imagine the look he gave me (via Skype), when I asked him to get a buddy to take a full length photo of him in uniform (front and back). But he entertained my request and a couple weeks later Songbird had her own soft, huggable, mini-Daddy to love on. Recommended by child psychologists, they’re a tangible way of dealing with separation. And machine washable too! We try to Skype with Daddy a couple times a week so the kids can tell him their life stories face-to-face. 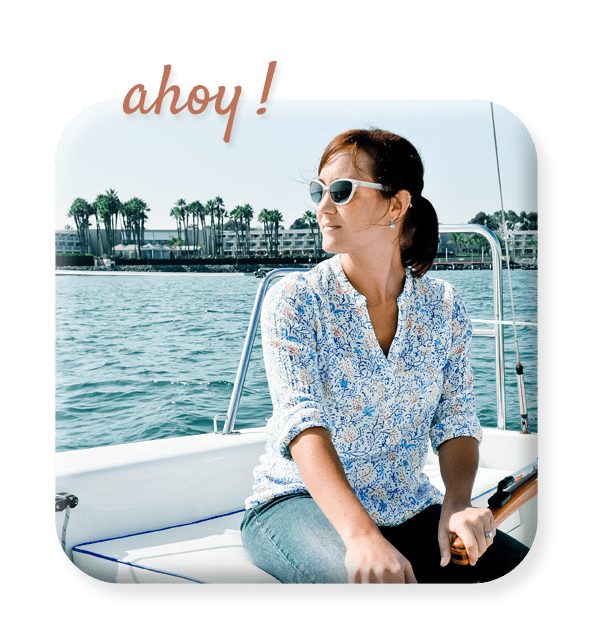 There are also fantastic apps that allow Handsome to read stories or play games with the kids in real time via the iPad – (Ustyme, Kindoma and Caribu). What about your family? Do you have other helpful ideas? Leave a comment and share them with us! We’re always on the lookout for new chat apps! Will definitely look up Tango and give it a try. Thanks Sharon! You know how much I love FOCUS – big time. Otherwise, you touched on all our favorite deployment “ways”. Monthly celebrations are a fabulous idea! Would give us milestones to strive towards. Time always flies faster when you’re looking forward to something – especially ice cream!